Barbacoa por la desayuna .. .. ?? Si! si! 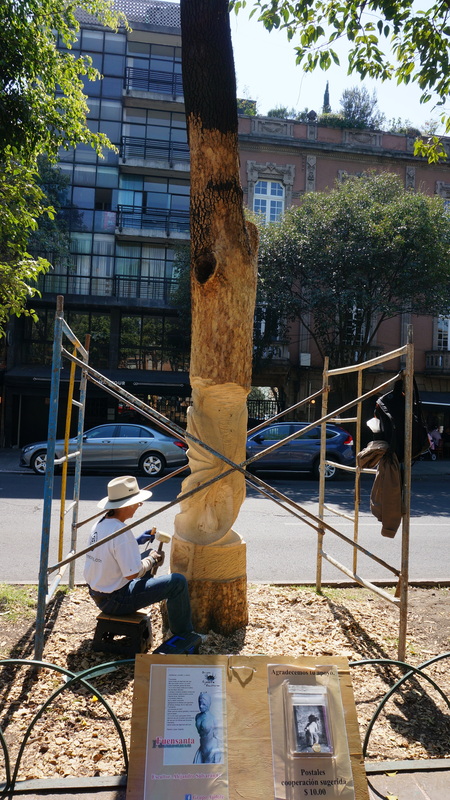 More on Mexico City! Barbacoa por la desayuna?? Si … Si!! Our flight to Mexico City was a bit bumpier than usual, but nothing too bad. 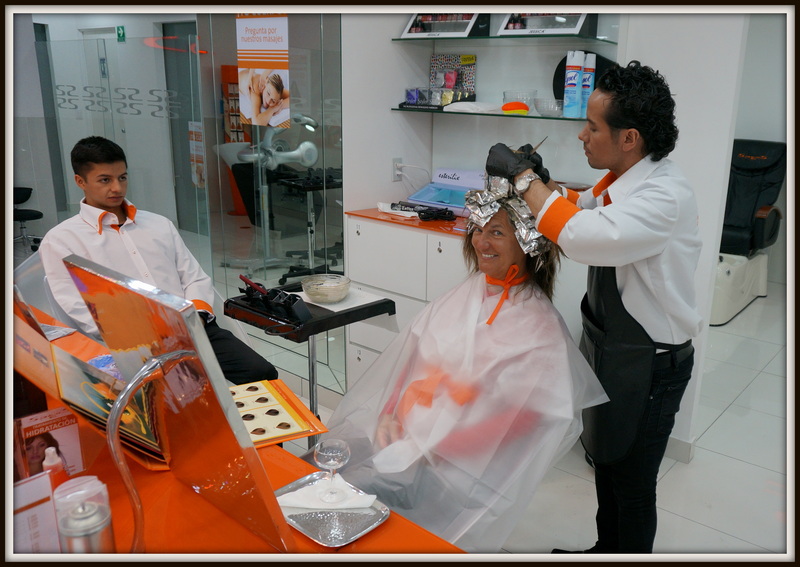 Arriving at Hotel Puebla around midnight we settled in to a familiar neighbourhood – Roma Norte. 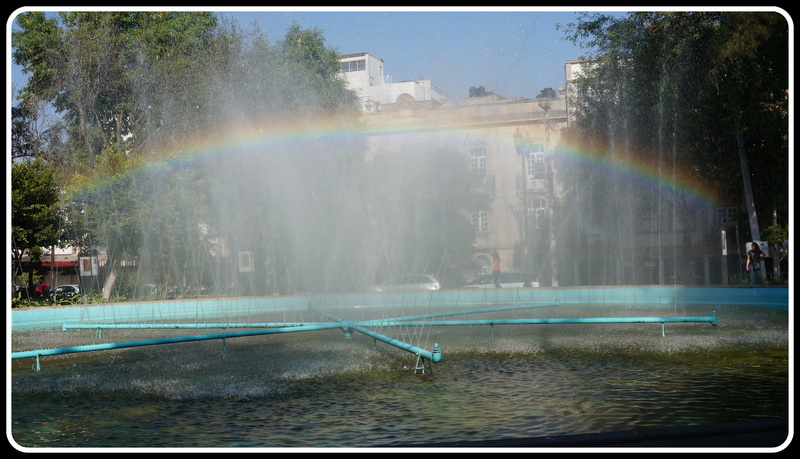 In the morning we were up and on the streets before Mexico City (DF) really came alive. In Grant’s usual fashion we were walking to breakfast about 5 blocks away …. Really I am not sure how many increments of those 5 blocks we walked … maybe 45 minutes? 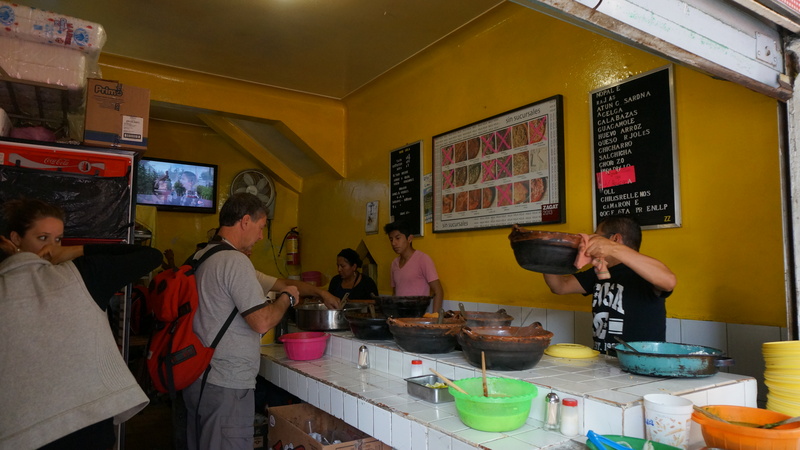 We found El Hidalguense Barbacoa … .this place is only open on the weekends, Friday through Sunday, and usually sells out by noon to 2 ish. 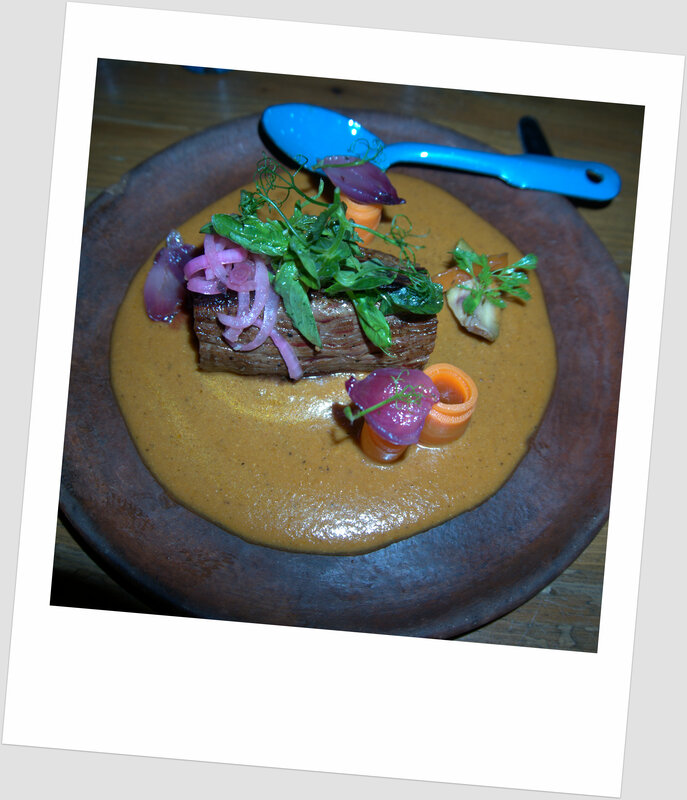 Barbacoa La Higuedense – this lamb pit roasted all night resting on maguey leaves – mouth waveringly tender and delicious. The only thing on the menu is barbecued lamb and its accompaniments. 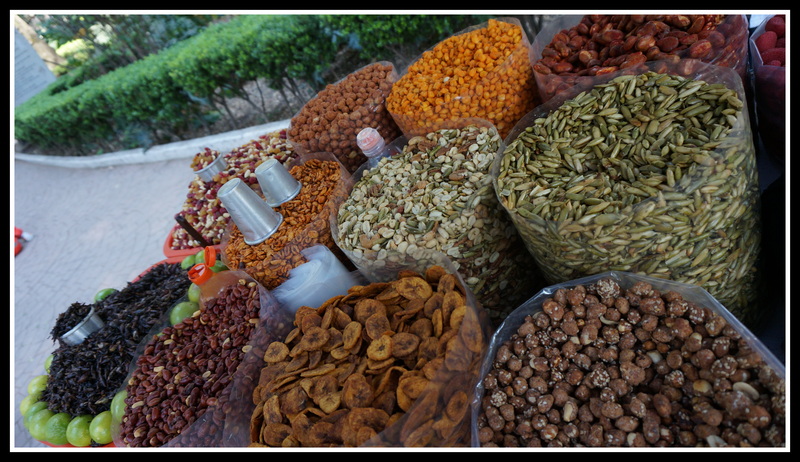 Many of them …. 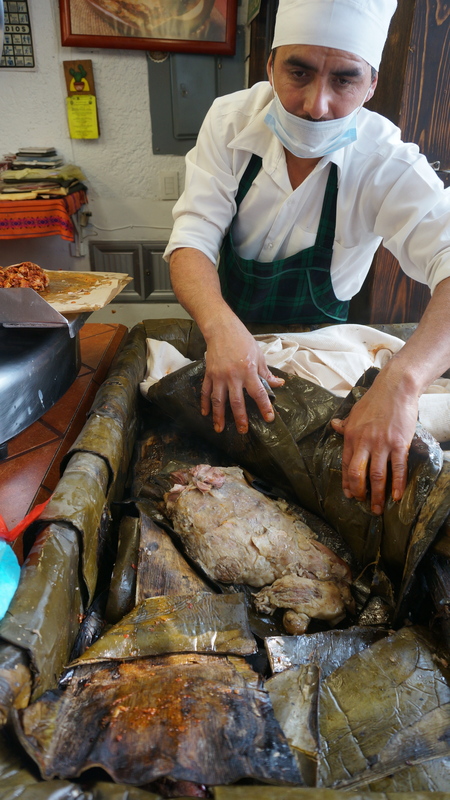 The lamb is butchered and put into a pit to roast and steam on top of maguey leaves (the plant that produces mescal or tequila). The entire lamb is put into this, along with seasonings. 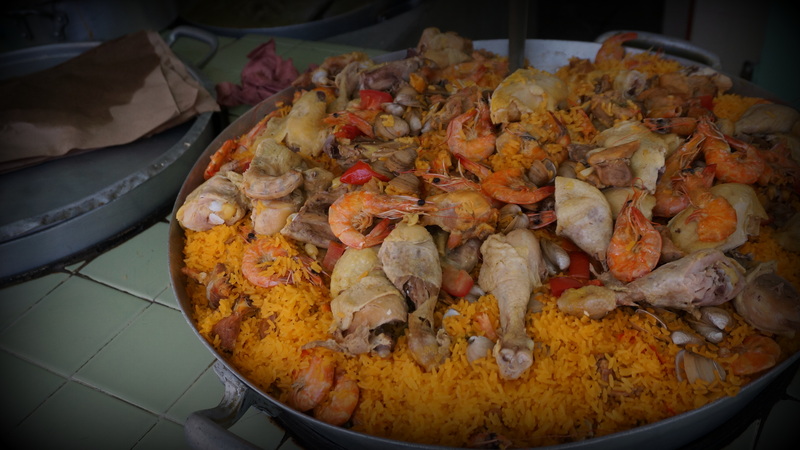 There is no testing for seasoning through the cooking process, once it is sealed up with the ingredients and covered with yet more maguey leaves the pit is sealed and the lamb allowed to barbecue roast overnight. In the early hours of the morning the lamb is removed from the pit, juices are poured off to create the soup, and the lamb pieces (included the stomach) removed to another maguey leaf lined wooden crate to keep warm. 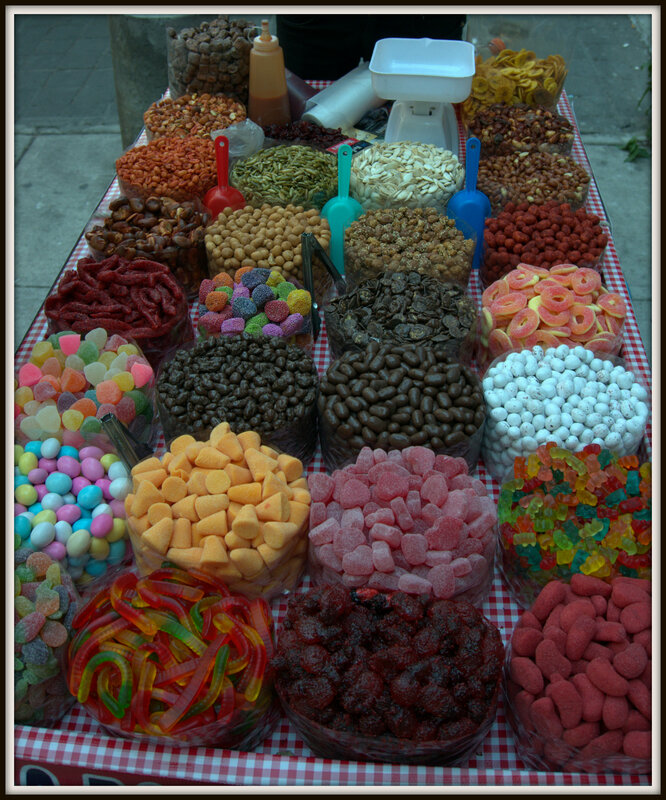 This is then sold in the restaurant along with all the accompaniments, or sold by the kg to go. This place is busy! 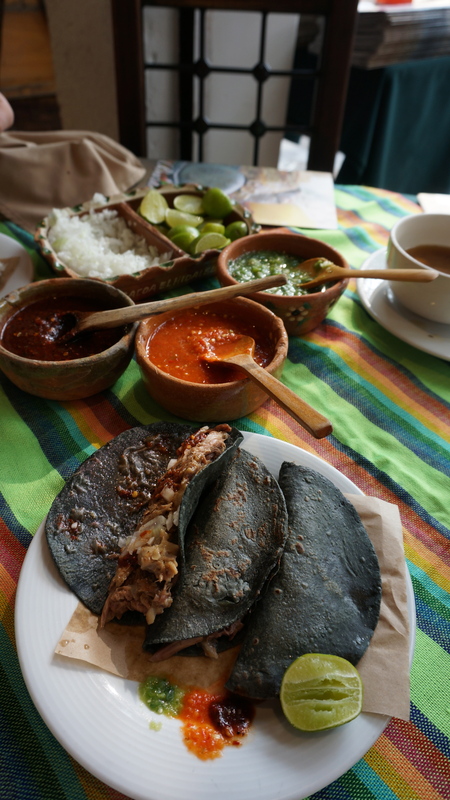 With good reason too, the lamb was delicious, and those blue corn tortillas so perfect for serving. 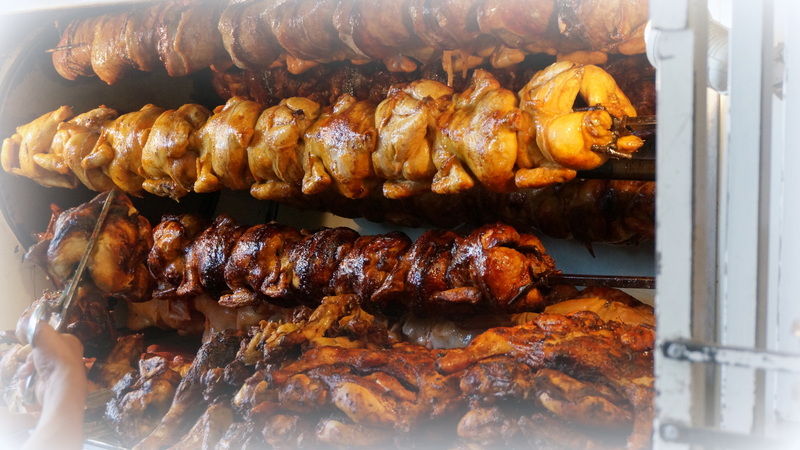 Our appetites are not used to such a meat fest early in the morning though so we were not really able to do it justice in the form of eating a lot of it, but what we did eat we thought was fantastic. 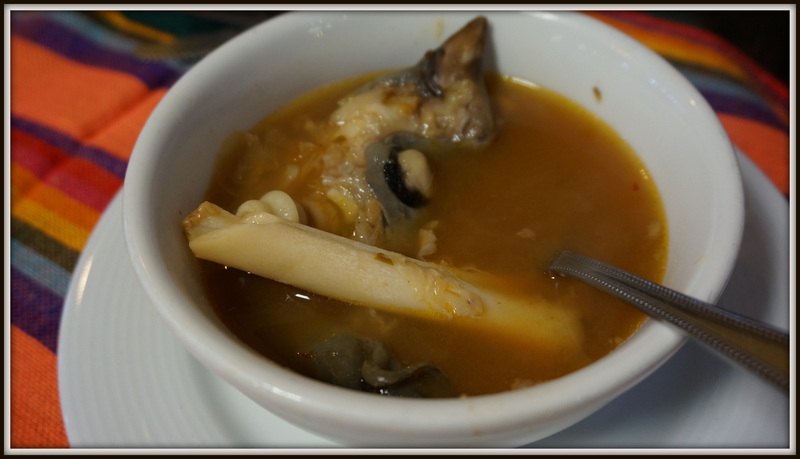 The broth of that soup was unbelievable. 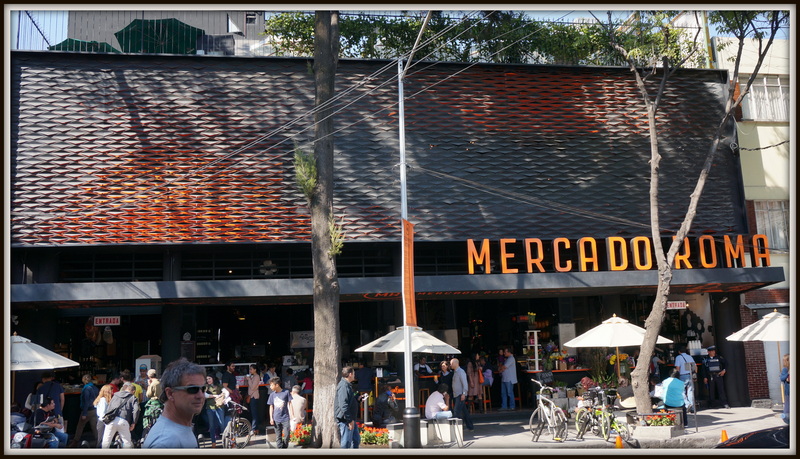 We set out to walk it off and we found a new market – Roma Norte Mercado Organico. 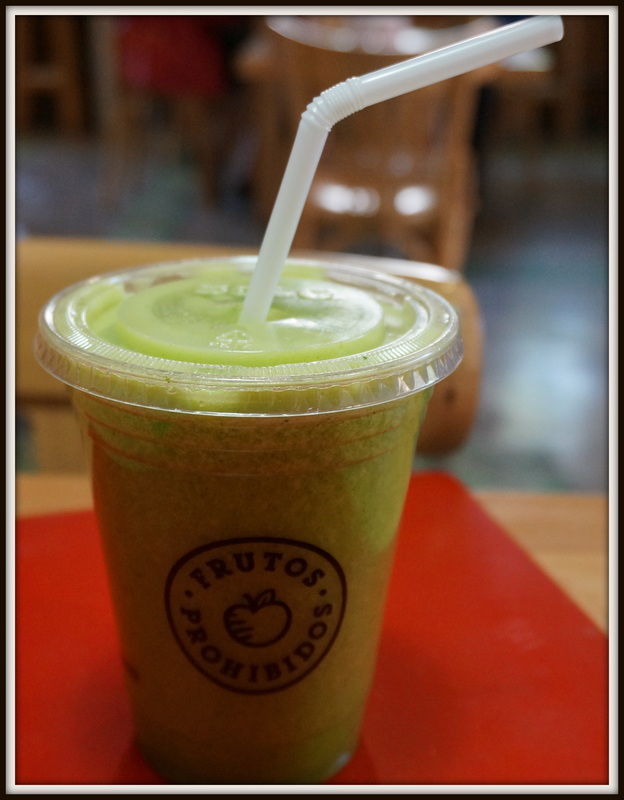 This place takes the usual Mexican Mercado to another whole level. What a beautiful building! 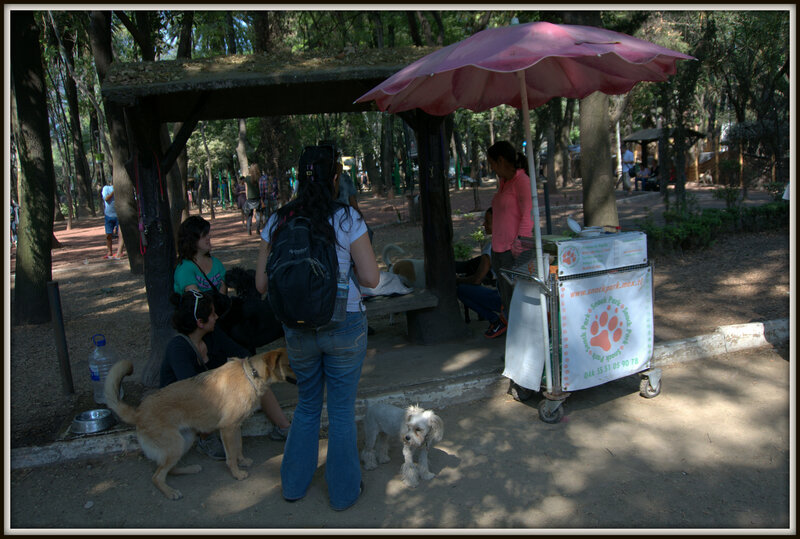 Such tiny little spots sell a variety of amazing food and beverages. 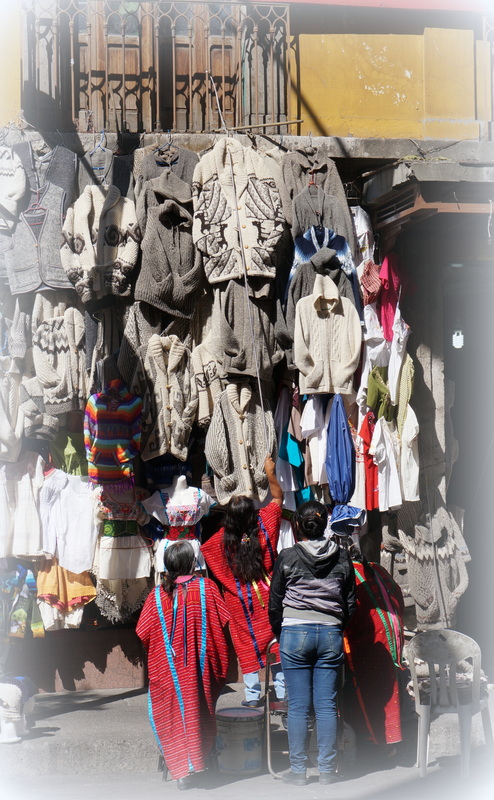 In this market we finally found the sea salt from Cuyutlan that we had walked blocks in search of on our last trip here … Wilson wanted that blog called “Salt of the Earth” …. 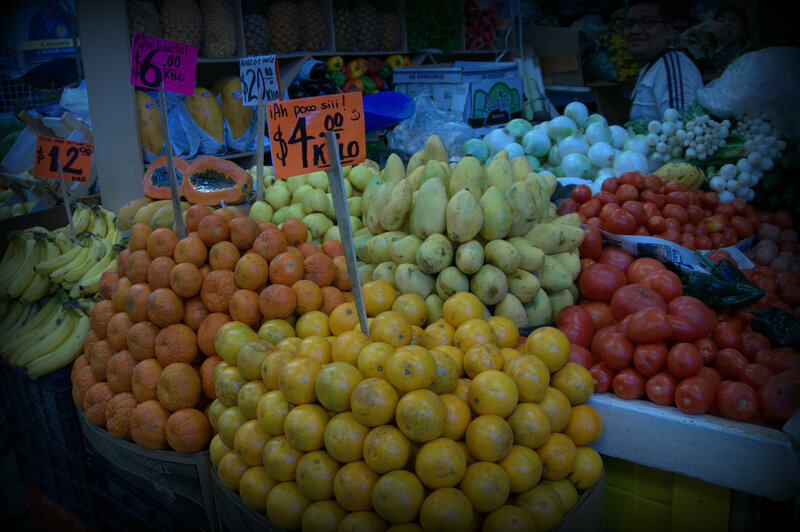 Just 1 shot of the magnificent interior of the newest market, in Roma Norte – Mexico City. Amazing food. 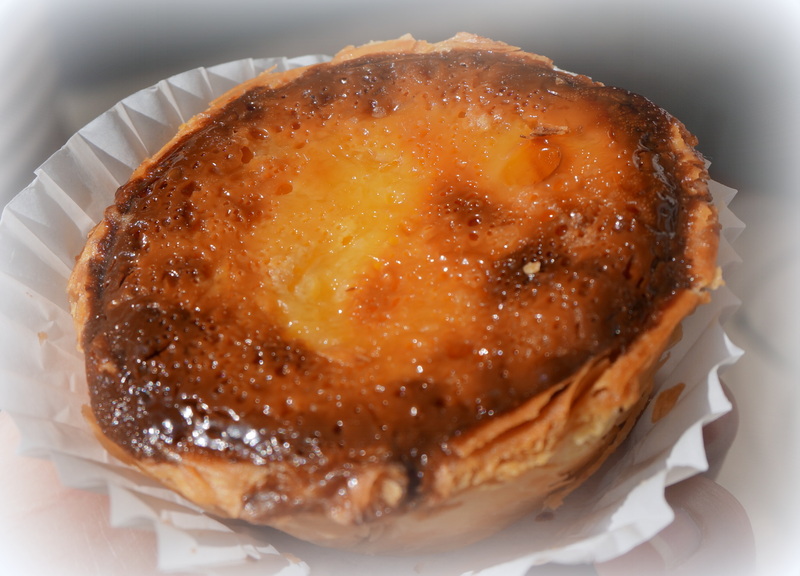 Grant had read about the Mercado, and about the amazing Portuguese tart sold there … naturally we had to try it – yes breakfast dessert following barbecue … I’m still dreaming of the delicious crispy flakiness of the pastry combined with the luscious cream filling. Exterior of Carlos Slim Gallery (dedicated to his wife), like a shimmering mirror. 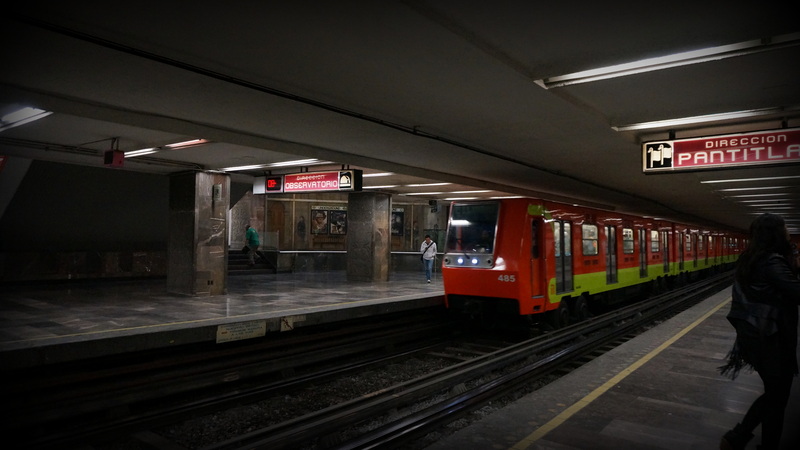 Next was a taxi to a swanky neighbourhood – Polanco. 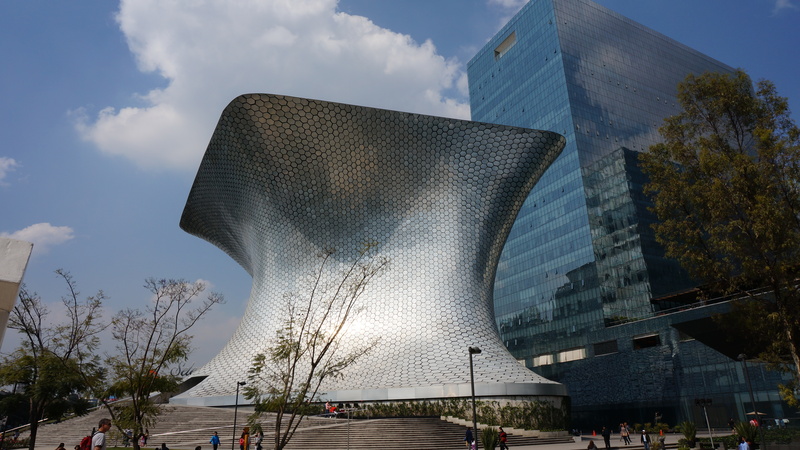 Definitely easy to tell just how swanky by the size of the Saks 5th Ave store ….. Our destination was an art museum built by an individual that was once the wealthiest man in the world – the owner of Telcel, Carlos Slim. 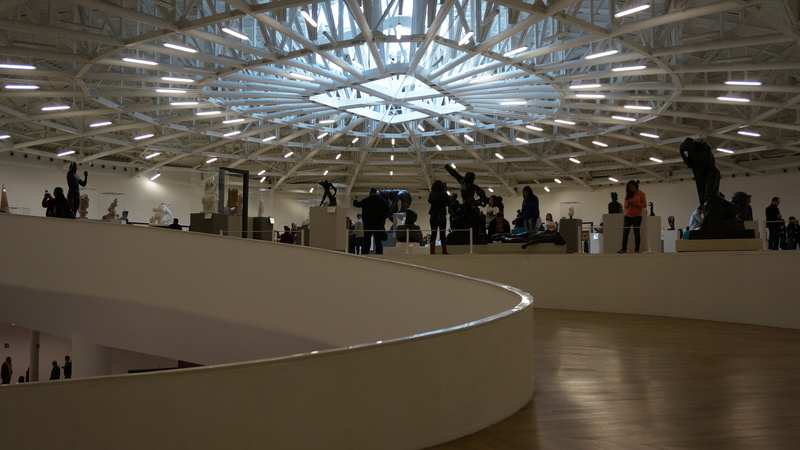 Hard to even describe this building, looking like a mirror of unusual proportions … inside is an even harder to describe art gallery – totally round interior in white with wooden floors. 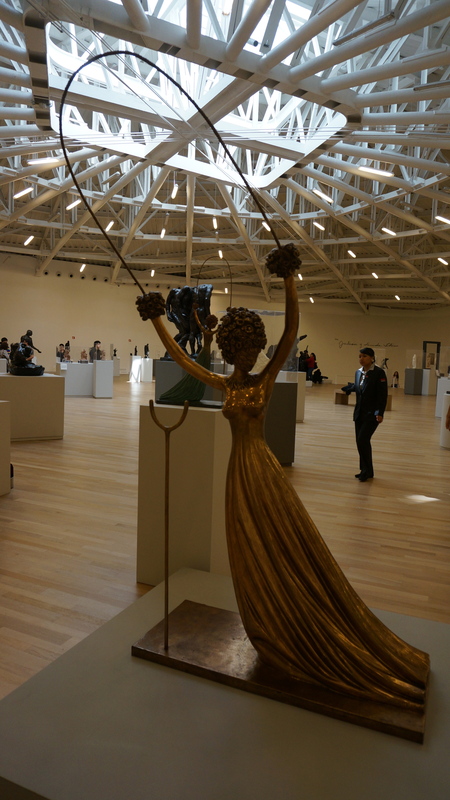 Interior – the entire upper floor filled with the most incredible sculptors work. The first painting to greet us was a Van Gogh! In order to ascend the building, you walk up a sloped ramp along the outside perimeter. Not only are the walls sloping towards you (stay away from the outside edge or you’ll bonk your head) the floors have a slight slope as well. Totally disconcerting, and yes – a little vertiginous. 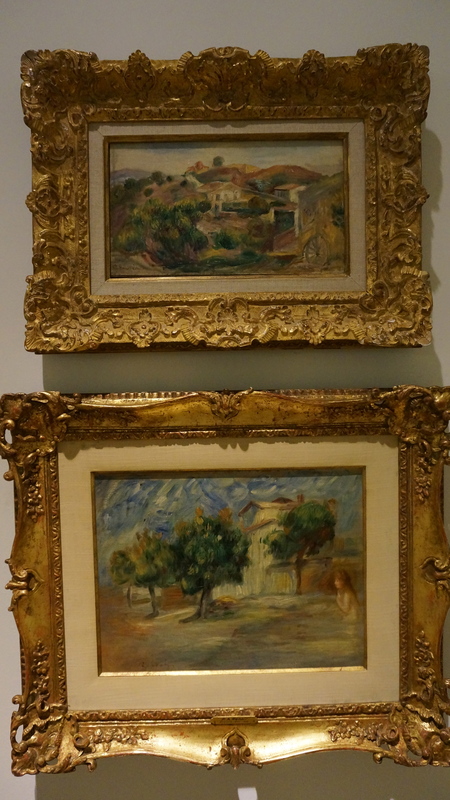 The art housed in the gallery is just beyond belief – Salvador Dali, Monet, Renoir, and Rodin and on and on and on. 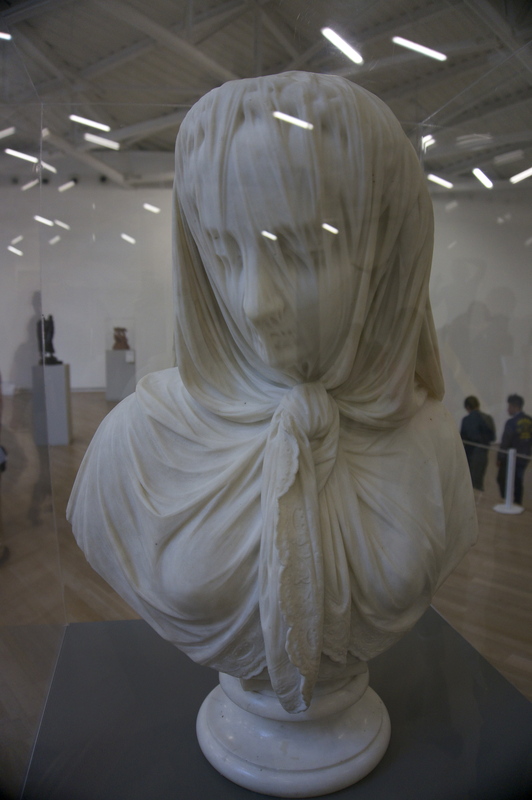 It is just wonderful that all this artwork is free to view, and not only that – not behind any type of glass or protective barrier aside from a few of the sculptures that are just to delicate to risk. 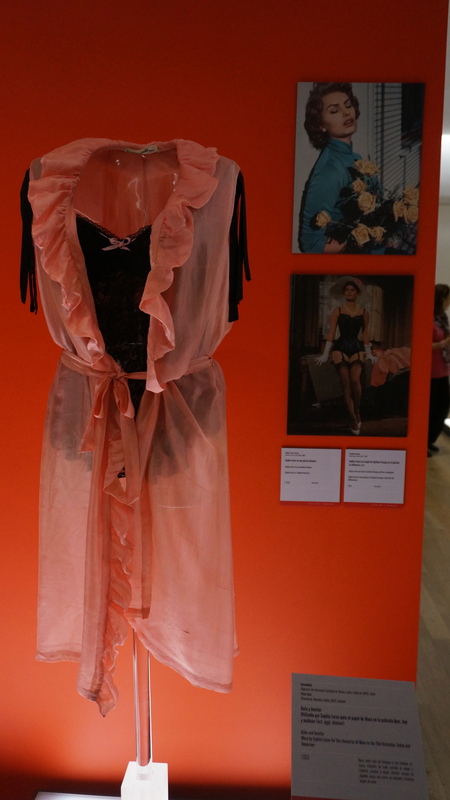 Alongside all this prestigious artwork is an entire floor dedicated to Sophia Loren – her clothing worn in movies, as well as clothing worn on a daily basis. Again – none of this behind any type of barrier. The Oscar however was in a glass case. One of the many Sophia Loren outfits from her movies. 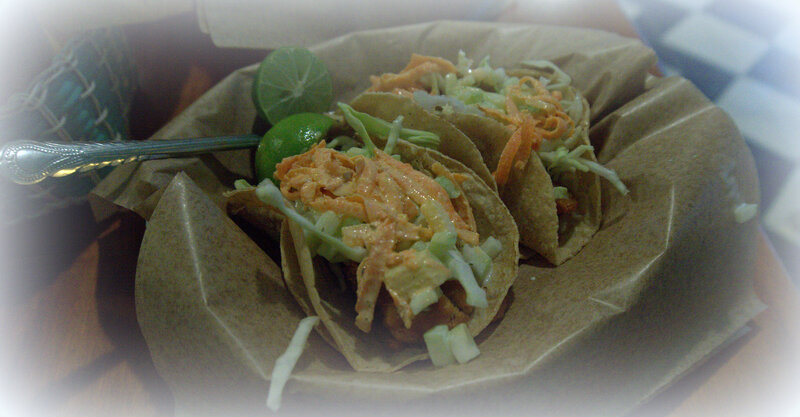 Lunch was street tacos – pretty much guaranteed to be fabulous in Mexico – and for the grand prize of less than $5.00 we enjoyed shrimp, pork, and chicken tacos with some nice cold water. Served up in a jiffy you – feeling somewhat like you were at Subway – you chose your own toppings for the owner/chef to heap on. 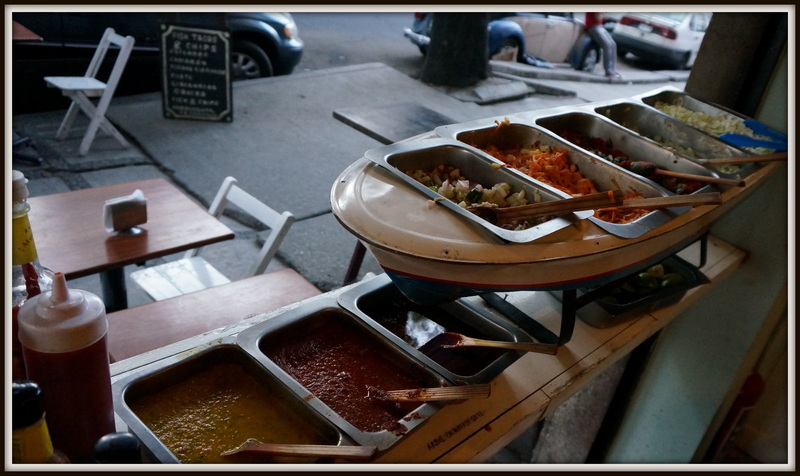 Tacos la Hola – another favourite taco joint on the streets of Mexico city. 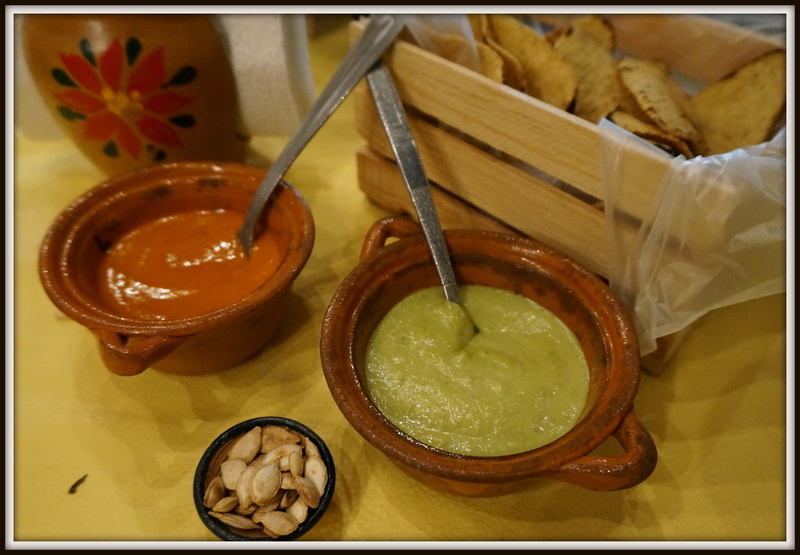 Salsas and lime available for your own final seasoning and the whole thing was mouth watering, finger licking good. 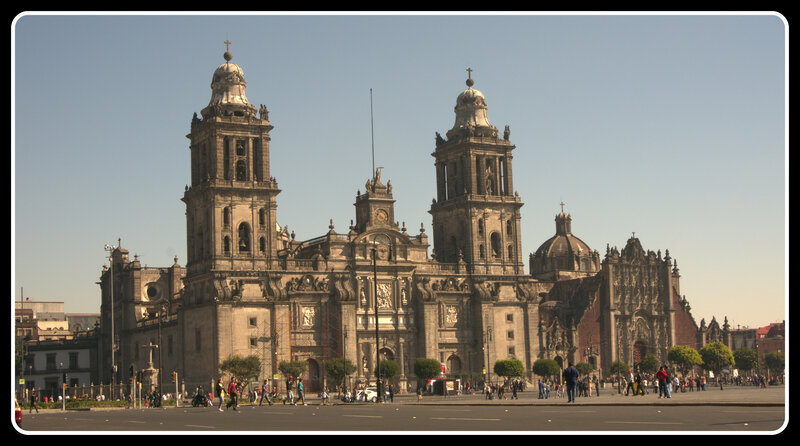 On our way back to Hotel Puebla we stopped at La Ceverceria for a drink – Grant got a cerveca and I got a gin – you should have seen Grant’s eyes pop at the amount of gin he watched the bartender free hand pour in – I was hardly able to get much soda water in there! Siesta time for a bit – so nice to stretch out after walking a number of 5 block increments. Dinner was at Yuban – we had been there with Hayley and the girls shortly after they opened a year ago. 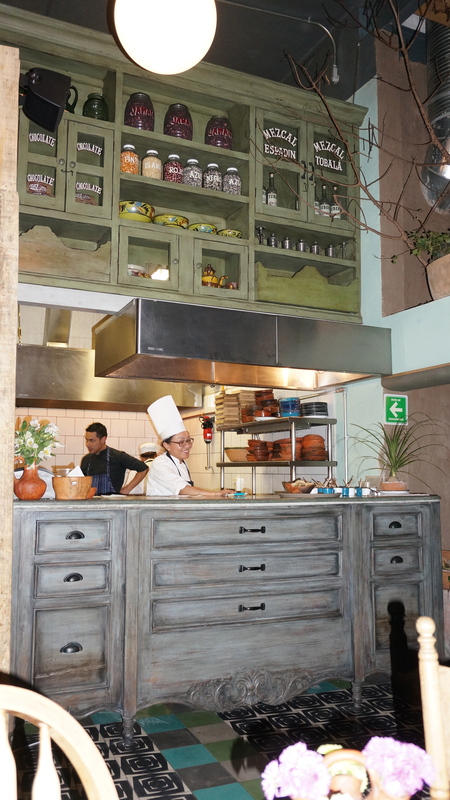 The place was a lot busier, and with a new team of staff members they are executing Oaxacan cuisine even better than previously. 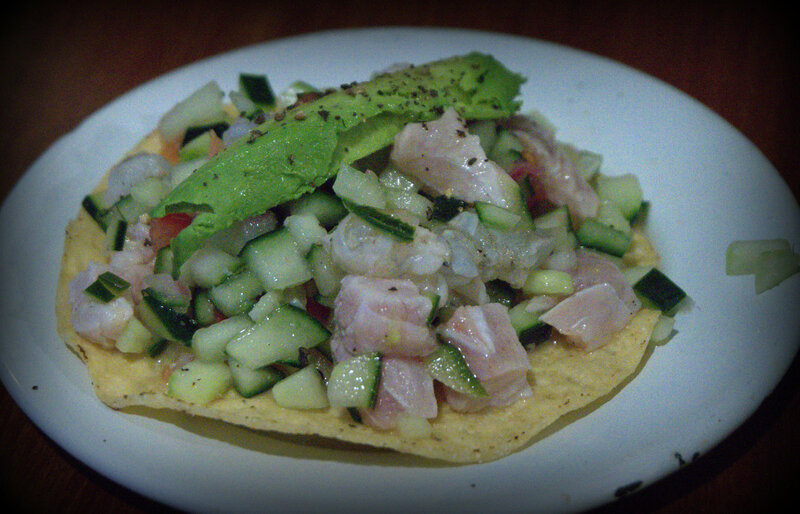 Yuban Restaurant – absolutely fabulous Oaxacan cuisine. 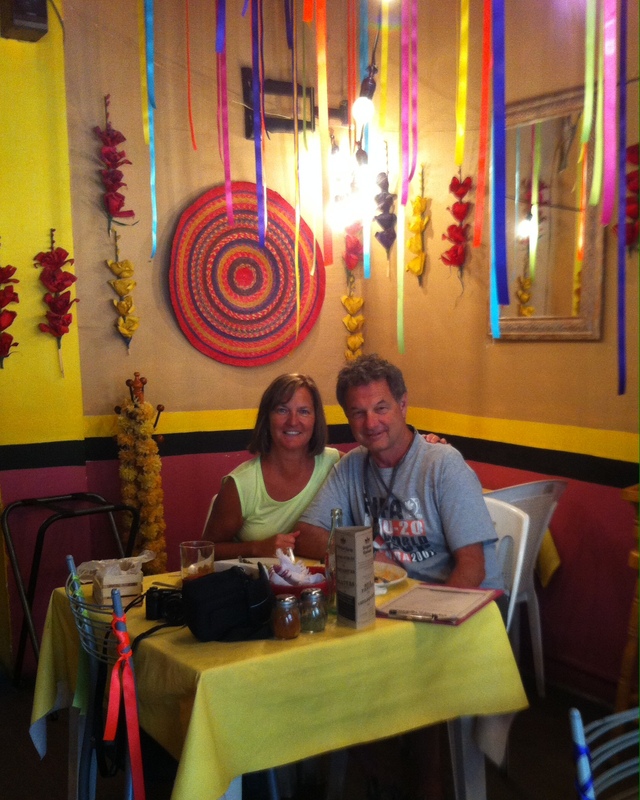 My only concern was the price of a glass of wine – 150 pesos, which is hugely pricey when a top end meal is 236 pesos. Did I splurge anyway? You bet – twice. I’m worth it. We aren’t sure if they thought I was a famous blogger or not with all the photos I was taking but we sure were treated well, including a complimentary house cocktail at the end of the meal – without question the best mescal cocktail I have ever had. Pretty darn impossible to not love a mescal cocktail that tastes as good as it looks! 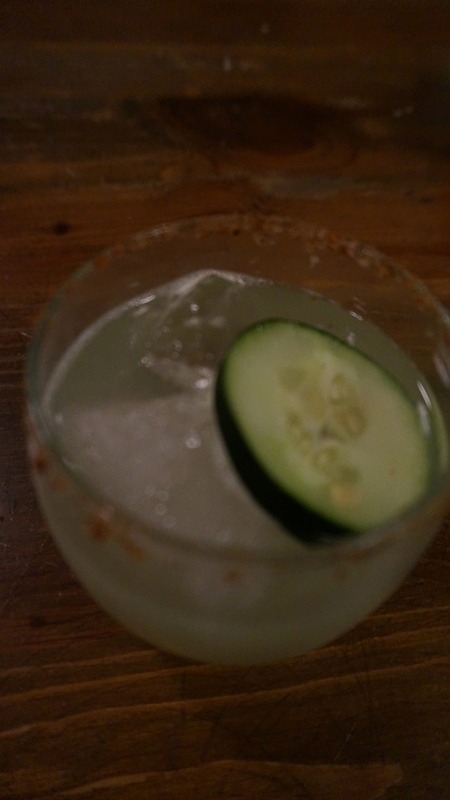 Smoky mescal combined with refreshing cucumber is a great combo. 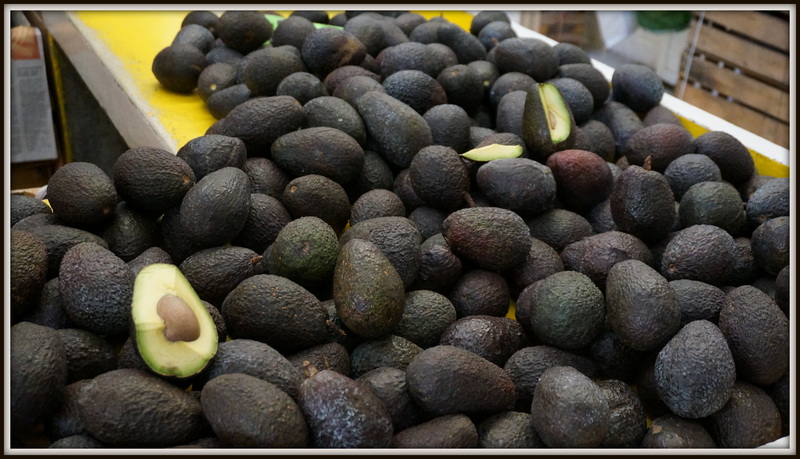 The new house manager – a young guy, also offered to take us on a 4 hour drive to the smaller village in Oaxaca were they source all their ingredients to make their cuisine. I would have jumped at the chance but Grant remembers those roads better than I ……….. In the end, he also gave me his email and said that if I was ever coming back to be sure to let him know so that he was able to take good care of us … hmm – I’m quite sure he has never heard of http://www.chattykathychatsandcooks.com but you just never know. 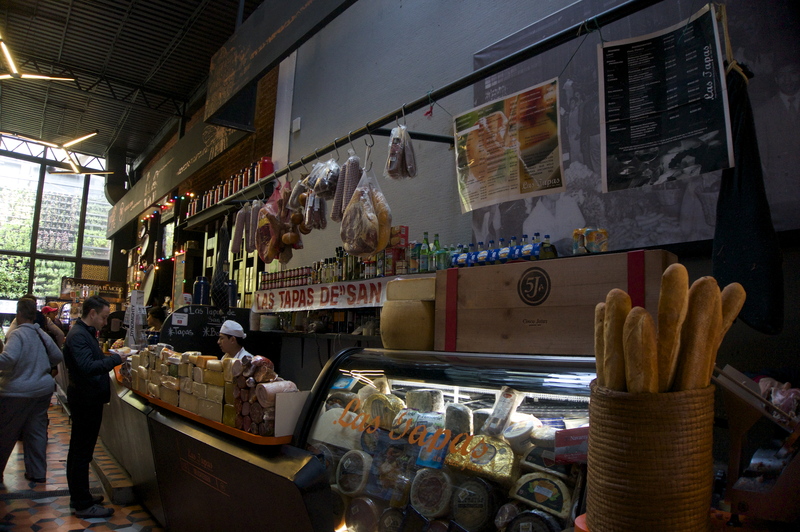 After a good night’s sleep we had a quick 5 block walk (translate about 30 minutes) to Monica Patina’s deli – we’ve been there before with the family and you will all know right away how good it was. 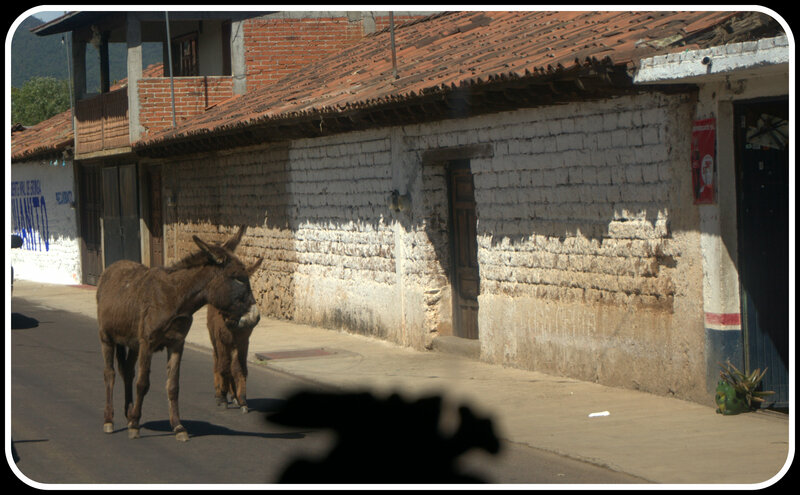 Back to the hotel to catch a taxi to the airport and an Interjet flight to Zihuatenajo. Sunshine here we come.